In March, 2003, I went from being a Glenn Beck listening dittohead to being a Liberal. Since then, I have made thousands of contributions to progressive websites. Finally, I have my own website to collect these ideas and through my own example, ultimately change people who call themselves conservatives into true liberals! Don't think I can do it? Prepare to be challenged! Will File Service Take Downs Result in Media Sales Spike? Only Countries with Socialized Medicine have AAA Bond ratings. I apologize for this sorry excuse for a website, but I am TRYING to have a life! Over the last couple of months people have asked more about my provocative user name and I’ve pointed them to this website. I believe I’ve written this somewhere, but the fact that “my story” (my transformation from a right wing talk radio listening conservative to a left-of-center liberal) isn’t on this website yet is because it’s a LONG story! But after having replied to people about my past, I had to add a new ‘post’ to this WordPress blog to make sure people know I’m still alive! I have since renewed my membership to the Democratic Underground, however, I find myself using Reddit much more. Category: Liberal Blogs & BBS, Reddit | Comments Off on Hi there Redditors! What are the chances that February will see a SPIKE of sales for the media companies? PS: I created this blog post because Reddit’s technology group doesn’t permit “self” posts. Category: News | Comments Off on Will File Service Take Downs Result in Media Sales Spike? I think that it’s a great strategy of Occupy Wall Street or “OWS” that they don’t have an easily read list of demands. Weeks ago, at the time of this writing, it was clearly stated that the reason WHY there was no “list of demands”. It was that if there was some simple list, whatever action(s) that the protesters demanded would then be taken up by the very same people who Wall Street controls, and that’s half the problem. But the question remains. People in the media are looking for anything to attack the enemies of their owners and so are now attacking OWS’s lack of specifics to paint them as not really knowing what they (we) want. The current situation doesn’t work for the 99%, and the current SYSTEM doesn’t get us to where it does. I think I can also speak for much of OWS in that we really don’t care how we get to the point where things DO work for the 99%, and so we can hash those details out. I think it’s fair, however, to say that the current “Republicans want a fantasy world and the Democrats say they can’t do anything because of the Republicans” simply isn’t getting us anywhere. In his recent article in Mother Jones, The Gaping Hole in Ron Paul’s Health Care Policy, Rick Ungar does a very good job of breaking down the problems with health care in a Ron Paul world. The author has a great ability to work through the BS, even though common sense points to the inevitable conclusion from the beginning. It’s like someone teasing out the finer points with someone suggesting gravity doesn’t exist. Drilling through point by point, then proving that gravity indeed, does exist, rather than starting out, “Are you freaking crazy?” and hoping the idiots would simply wake the freak up. Of course, my problem with this very polite analysis is that it assumes that a great many of Ron Paul followers aren’t simply a bunch of freaking liars. The only thing, however, is they have to ‘sell’ the plan for their personal gain onto the people who will be paying the price for their gain. (this is why they detest Democratic voting systems) And that’s where the fantasy world / lying comes in. I don’t respect liars. That’s why I don’t give Paulites the respect they want. I think treating them with respect only legitimizes and fuels them, because using their ever-creative minds, they’ll poke little holes in the argument (see the comments below the article) and so we go round and round arguing something we already know to be false. We don’t have the time for fantasies. 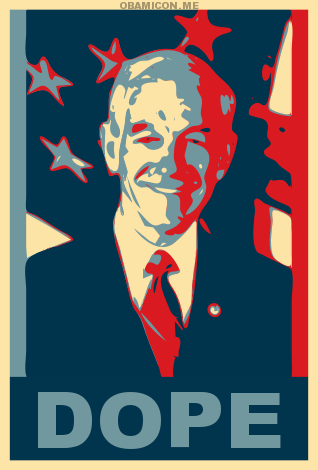 We need real world solutions and they’re out there, but we have to live in the real world to deal with them, not the world of Ron Paul. Category: Politics | Comments Off on Only Countries with Socialized Medicine have AAA Bond ratings. This week, Paul Ferrell writes in Marketwatch about former Reagan insider David Stockman’s recent editorial in the NY Times about how Republicans have all but destroyed the US Economy. In the midst of a debate as to whether or not to continue the Bush tax cuts, which have disproportionately benefited the upper class. But Stockman doesn’t pull any punches in his editorial. IF there were such a thing as Chapter 11 for politicians, the Republican push to extend the unaffordable Bush tax cuts would amount to a bankruptcy filing. It is therefore unseemly for the Senate minority leader, Mitch McConnell, to insist that the nation’s wealthiest taxpayers be spared even a three-percentage-point rate increase. More fundamentally, Mr. McConnell’s stand puts the lie to the Republican pretense that its new monetarist and supply-side doctrines are rooted in its traditional financial philosophy. And he should know, because it was Stockman who took the lead in directing passage of the “Reagan Budget” the first year of his Presidency. Later that year, Stockman drew fire for his candid remarks admitting that, like most Republican policies, Reagan’s 1981 tax cut was passed as a lie (he called it a Trojan Horse) to justify giving tax breaks to those already benefiting most from our economy. But his current editorial goes even further than his prior admissions of Republicans selling benefits to all but delivering them only to the wealthy. He reviews the history of the failed Republican economy hypothesis of expecting tax cuts to the wealthy resulting in growing the economy. He also doles out a healthy amount of criticism to those on the academic and political fringe who are calling for a restoration of the gold standard which, he writes, helped create the Great Depression. That all brings him back to the present and points out how those Republicans arguing for extending the Bush tax cuts not only haven’t learned from the history of the last century, but from the last decade, and that to make a universally known failed policy the cornerstone of their platform, shows how ideologically bankrupt the Republicans are. Brad Friedman in his great blog, The Brad Blog, does a better job than I can to put this last Tuesday’s primary in perspective. Brad debunks the spin that’s been spoon fed to and regurgitated by the media about this being some kind of Tea Party victory. Brad Friedman does a state by state analysis clearing showing that the results from May 18th were NOT some kind of right wing uprising, rather, an extension of the progressive movement which started in 2006. While the Republican Rand Paul v. Trey Grayson race received, hands down, the most publicity nationally, Paul would actually have come in third place had the race been an open contest between all candidates, as both of the two leading Democratic candidates Jack Conway and Daniel Mongiardo each received more votes than Paul. Much more in his article. The BIG problem with the corporate political money decision. The media and the people aren’t getting the real problem with the SCOTUS / Corporate decision. While there have been a lot of “troubled” political pundits, none of them, from what I’ve read, have articulated the real problem with giving corporations the power to make political contributions without limit or regulation. I’m reading messages with people who are suggesting that little has changed. They suggest that the rich were already able to fund, however indirectly, basically the same kinds of advocacy ads before as they will be able to now through corporations. But this is not what can happen now. Not by a long shot. The issue is not how rich and powerful people can spend their own money. The issue is how rich and powerful people can spend YOUR money and use it against YOUR interests. Since the inception of IRA’s and 401k’s, the proportion of common stock owned by the middle class has exploded. The never-spoken truth is, however, that 100% of the CONTROL of those companies has remained in THE SAME HANDS. Category: Politics | Comments Off on The BIG problem with the corporate political money decision.